Block party Archi-new - Free Dwg file Blocks Cad autocad architecture. Archi-new 3D Dwg - Free Dwg file Blocks Cad autocad architecture. Susan and Colin Johnston had always wanted to build a home designed by an architect. So, after owning a little timber beach house at the top of Big Hill in south-eastern Victoria for 30 years, they decided to tear it down and start from scratch. The isolated property is located near the Great Ocean Road – one of Australia’s most spectacularly picturesque coastal landscapes. But what is remarkable about the sloped site is its close proximity to the beach, even though it’s surrounded by dense bush and mature eucalypts. It seems much further inland than what it actually is, until the views out towards Bass Strait and the small seaside towns of Lorne and Aireys Inlet become apparent. Any architect hired by the Johnstons had to be able to respond to a rugged environment. The couple took expert advice – from their son-in-law, Philip Goad, Chair of Architecture at the University of Melbourne – and Kerstin Thompson was hired, thanks to her reputation for designing homes in remote rural settings and weather-beaten coastal enclaves. Thompson’s triangular, three-bedroomed plan gave the 240m², two-levelled weekender a sense of dynamism and monumentality, while concrete block delivered a reassuringly robust material outcome. From the upper-level entry, the beach house appears to recede into the surrounding bush. Once inside, the space is configured to take advantage of the plan’s strict geometry. Thompson located the kitchen, lounge, dining and living areas, along with the master bedroom and ensuite, on the top level, so that the owners can shut off downstairs when it’s just the two of them. Their three grown children and respective families, including eight grandchildren, also use the house, and it is large enough to accommodate most of them at any one time. The grey-and-black palette is enriched by the use of Blackbutt for the joinery and the reveals that line the picture frame windows looking out to the sea. These reveals essentially become part of the window seats, which double as storage units in the dining area and master bedroom and add a warm, bespoke element that contrasts with the coolness of the concrete block. There’s a nice interplay between the structure’s right angle, which looks out towards the bush, and the opposing acute angle, which looks out to the sea. This corner of the house was potentially fraught with difficulties because it is so tight, but Thompson uses it to blur the boundary between inside and outside, transforming it into an interior balcony when the large glass windows are wide open. It offers both protection from and exposure to the landscape, while taking advantage of uninterrupted sea views. The plan’s uncommon geometry considers the site’s topography in regards to footprint, reinforcing Thompson’s clever environmental response. 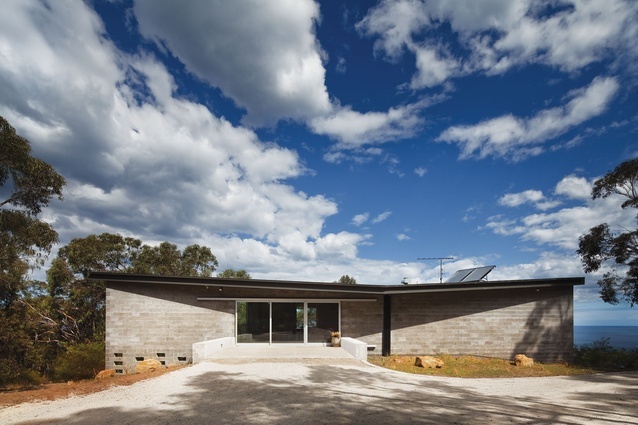 The architect has created a retreat that is easy for a big family to visit, while managing to stay within the Johnstons’ strict budget by utilising cost-effective concrete block as a building material. Susan and Colin – who permanently reside in Melbourne’s eastern suburbs – get to the beach house once a month for a couple of days but it’s typically in use by extended family every weekend. The couple’s existing furniture and soft furnishings – a rustic timber dining table, steel-framed kitchen stools and Persian rugs and cushions – perfectly suit the space.